The International Potato Center (CIP) has demonstrated the ability of beta-carotene-rich, orange-fleshed sweetpotato (OFSP) varieties to reduce vitamin A deficiency (VAD) and improve food security, but smallholders in Africa have a hard time preserving those nutritious roots, especially in drought-prone areas, where they become scarce soon after the harvest. In sub-Saharan Africa (SSA), sweetpotato roots generally only keep for a few weeks, and OFSP roots are perceived to have especially short shelf lives. This short shelf life reduces the health benefits of OFSP, since it means fresh roots are only available to eat for two or three months of a year. It also reduces marketing opportunities, since most roots are sold during the weeks following the harvest, when prices are normally low due to a glut. And it results in a shortage of planting material at the beginning of each rainy season. CIP scientists are thus promoting storage in dry sand to help farmers to extend the shelf life of their sweetpotato roots. The technique grew out of the Triple S approach, which uses sand storage to preserve enough sweetpotato roots to plant in irrigated seed beds six-to-eight weeks before seasonal rains start, to produce vines for planting. 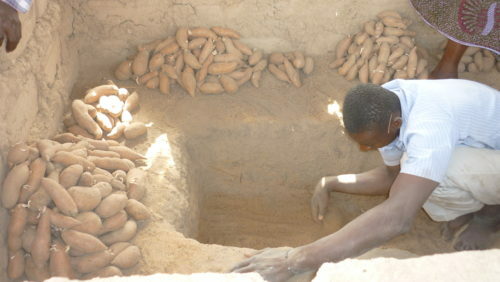 Researchers noted that people sometimes ate the roots they were storing to produce planting material, which indicated that sand storage can also be used to preserve sweetpotato roots for consumption. This allows people to sell and eat fresh sweetpotato for more months of the year, which makes the crop more attractive and marketable, and enables it to improve the incomes, food security and nutritional status of resource-poor farm families. 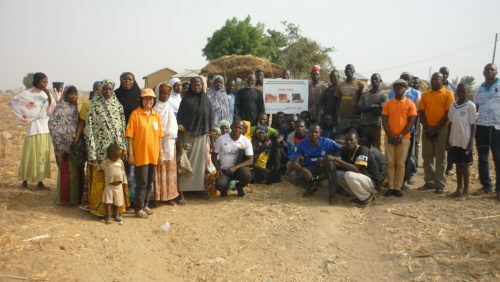 Erna Abidin with farmers who successfully tested sand storage of sweetpotato roots in Tampezua, Ghana. 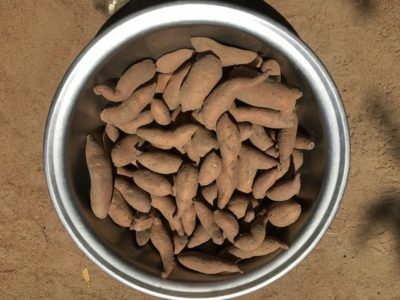 African farmers have tried various methods to extend the shelf life of their sweetpotatoes, which include storing the roots in soil, grass or ash, placing them in storage pits, or simply leaving them in the field and harvesting them piecemeal. However, such storage methods are usually only effective for a month or two, after which root quality declines due to rotting, infestation by pests and physiological deterioration. Since 2011, scientists from the International Potato Center (CIP) have been conducting research trials on the use of sand storage to improve the shelf life of sweetpotato roots in SSA countries that include Burkina Faso, Malawi and Ghana. The research has been undertaken at field stations and in communities as part of the Jumpstarting Orange-Fleshed Sweetpotato (OFSP) in West Africa project and interventions supported by Irish Aid and the United States Agency for International Development (USAID). Field trial results indicate OFSP roots can be stored in dry sand for at least 4 months in savanna areas, such as in Ghana and Burkina Faso, and as long as 7 months in the dry highlands of Malawi. These countries are among others in SSA where rural families are at high risk of malnutrition and food shortages during the dry season. Sand storage techniques have proven effective for preserving OFSP roots for consumption. Tests shown that the b-carotene levels in roots stored in dry sand remain high, at levels similar to freshly harvested roots, which means they continue to be effective at reducing VAD in children, pregnant women, lactating mothers and people living with HIV and AIDS. Under an ongoing USAID project in Ghana and Burkina Faso, sand storage demo trials were conducted at a rural community level as part of an effort to scale this technology in dry savanna areas. Adult training methods, farmer-managed research and training of trainers were used as key elements of our scaling strategy under this one-year project. In selected communities, farmers have been trained in the construction of sand storage boxes or stepped pits with a volume of 0.45 m3, which hold an average of 343 roots, and techniques for root selection and sand storage, as well as best agricultural practices to ensure good harvests. At the same time, farmers learn about the health benefits of eating OFSP and are taught ways to process and prepare the root, and incorporate it into the local diet. Farmers are also encouraged to share what they’ve learned with other farmers, to support the scaling process. At the beginning, farmers in Ghana and Burkina Faso had their doubts about sand storage, but after seeing the results of 4.5 months of storage, they greatly appreciated the technology. They have subsequently shared their experiences during market awareness campaigns, testifying about what they have learned from the research, which they completed in collaboration with the scientists. The overall result of 10 sand storage trials was that out of a total of 3,432 OFSP roots, an average of 62% was used for food, 27% were planted to produce vines for planting material, and 21% were thrown away due to rot and damage by diseases and pests. Storage for this length of time using traditional methods, on the other hand, would have resulted in 100% loss. Meanwhile, roots from these sand storage trials ware examined and an average of 58% of the roots used for food were of premium quality for good market prices or making delicious OFSP fries. When farmers store their sweetpotato roots in sand at the beginning of the five-month dry season, their family enjoys a reliable supply of nutritious OFSP. Taste tests showed that roots that have been stored in sand for 4 months are of an eating quality comparable to fresh harvested roots. And four months after the harvest, the farm-gate price of a 50 kg bag of roots was two to four times higher than during the harvest season. This is great news for the rural poor in drought-prone areas, because the technology can save them from hunger while improving their vitamin-A consumption and incomes. We are now working with partners on a new project to scale out this method to tens of thousands of households in the coming years. By Erna Abidin, sweetpotato seed system expert and former CIP project manager.